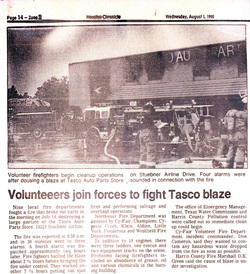 Tasco Auto Parts Store on Stuebner Airline Drive. Four alarms were sounded in connection with the fire. 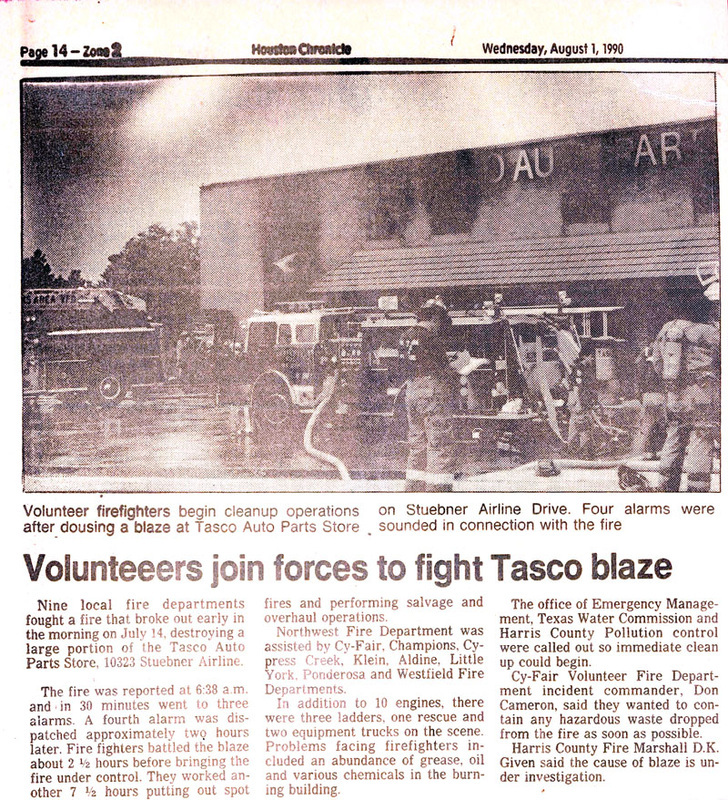 "Nine local fire departments fought a fire that broke out early in the morning on July 14, destroying a large portion of the Tasco Auto Parts Store, 10323 Stuebner Airline. The fire was reported at 6:38 a.m. and in 30 minutes went to three alarms. A fourth alarm was dispatched approximately two hours later. Fire fighters battled the blaze about 2.5 hours before bringing the fire under control. They worked another 7.5 hours putting out spot fires and performing salvage and overhaul operations. Northwest Fire Department was assisted by Cy-Fair, Champions, Cypress Creek, Klein, Aldine, Little York, Ponderosa and Westfield Fire Departments. In addition to 10 engines, there were three ladders, one rescue and two equipment trucks on the scene. Problems facing firefighters included an abundance of grease, oil and various chemicals in the burning building. The office of Emergency Management, Texas Water Commission and Harris County Pollution control were called out so immediate clean up could begin. Cy-Fair Volunteer Fire Department incident commander, Don Cameron, said they wanted to contain any hazardous waste dropped from the fire as soon as possible. Harris County Fire Marshall D.K. Given said the cause of blaze is under investigation. "